Hi All! It's Kim from the Fotobella.com design team. I absolutely love the Christmas season and my shipment from Fotobella only added to the excitement this year. Each month, I am like a kid anxiously anticipating Santa’s visit. I am so excited when my package finally arrives! :) We never know what product we will get to work with that month. I was elated when I opened my box and saw that it was one of my favorite holiday collections, All is Bright from My Mind’s Eye. It was like an early Christmas present! This month, I received All is Bright “I Want It All Bundle”. It is a beautiful holiday collection in shades of red, turquoise & cream with a slightly vintage flair. The bundle is LOADED with of creative goodies. It contains 2 of each heavyweight double-sided paper in the line, a 12x12 chipboard elements sheet, a 12x12 sticker accessories sheet, decorative brads, decorative buttons, faceted rhinestones in 3 colors, a stamp set, 3 decorative tapes, 3 different twines, coordinating layered stickers and a 4x6 accessory pad. 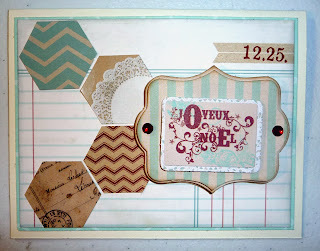 I am so excited to share the projects I did with this kit. Listed below are only a few. Keep an eye out for my future posts that will feature 2 special projects with step-by-step instructions. Thanks for stopping by the blog today. 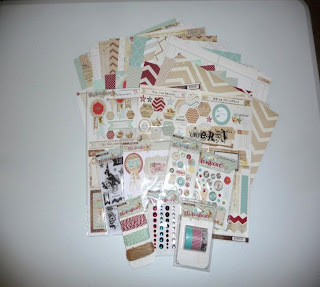 I hope you are inspired to do some of your own holiday projects with this awesome All is Bright “I Want It All Bundle”. This is such a versatile bundle. With the beautiful hues of teal, cream & red, there are many other occasions it can be used for. Don’t limit yourself to just holiday photos. I absolutely love the embellishments that come in this bundle. They make for quick & easy cards, perfect for holiday gift giving. 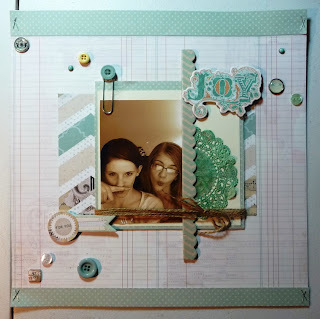 by making creative, shadow box frames. Set the holiday mood with these little cutie! What a great idea for place cards, a small table decoration or even a pretty ornament on the tree. Do you ever wonder how to display all of you holiday photo cards? Try this inexpensive, fun trick with your decorative tapes & a few binder clips. You can use it as a stand or decorative clips for your card display rack. I absolutely love this MME "All is Bright" Collection. Kim you make some amazing different projects. I love your style and thanks for giving me some great ideas to make for Christmas gifts... I can't wait to see what you have in store for us next. Happy to see you are on this DT.